Today, April 26th 2019, is not an official school holiday in Italy. The next school holiday in Italy starts 08-06-2019 (Summer holiday 2019). Below are the Italian school holiday dates 2019. Italy is a long peninsula shaped country like a boot, surrounded on the west by the Tyrrhenian Sea and on the east by the Adriatic. It is bounded by France, Switzerland, Austria, and Slovenia to the north. The Apennine Mountains form the peninsula’s backbone; the Alps form its northern boundary. Italy is well known for it’s history and culture. Cities like Rome or Milan are crowded with tourists. The north is well known because of the various lakes of which Garda is probably the most famous. Below the Italian school holidays 2019. REMARK: Small differences by region are possible. Long week-end! REMARK: First region through to last region. 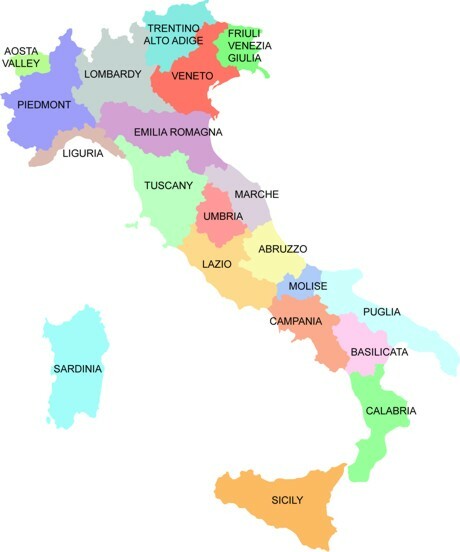 See a map of the Italian regions below. Below is a map which contains the Italian school holiday regions.